Colorful crops, interactive school lessons, and a community gathering space-- the Students’ Learning Garden is becoming a reality. Students and teachers, with input from staff and community members, have been hard at work for many months planning, researching, and now executing the project. From visits to homesteading operations to performing skits about waste management, students have combined life lessons with academic skills in preparation for the culmination of their three-year Sustainability Curriculum. At the end of February, they sprung into the next step in the process by purchasing gardening tools. Another asset the students have been leveraging? Homemade dictionaries. The unique study guides are full of sustainability-related terms to apply to the garden. Below, the students write and practice their definitions. Combining the power of words and actions, the College des Savior students are putting all of their assets towards the end goal of a thriving Learning Garden. Click here for the GBA 2015 Gala Auction Item Sneak Peak! Giving Back to Africa is thrilled to announce its 2015 gala, Congo: Continue the Story in the Garden! The gala will be held at the Clubhouse at the Fields on Sunday, August 30th, from 5:30-7:30 p.m. We will have cocktails, heavy appetizers, an auction, and an African market. In order to purchase tickets online, please click here. The gala is a tradition for GBA, one that we look forward to each year. We invite you to share in our appreciation to our donors and supporters and celebrate together as we review this year's accomplishments and look towards the future. Our theme of the garden ties in with our current curriculum, focused on teaching the students about sustainability. This curriculum incorporates lessons learned from previous curriculum on water, waste management, and nutrition, and will culminate in the creation of a Student's Learning Garden. Follow us on Facebook and on Twitter (@GBAfrica) for updates on the gala, reminders, and new information about vendors, auction items, and more! If you have questions about the gala or would like to learn more, please contact us at 812-340-6649. You're Invited to Our 2015 Gala: Congo, Continue the Story in the Garden! You can purchase tickets by clicking here or the photo above. GBA recently had the opportunity to do one of its favorite things: interact with the Bloomington community! On November 3rd, Bloomington-based nonprofit Books and Beyond hosted a Roundtable on Service and Non-Profits in Sub-Saharan Africa. GBA, along with Books and Beyond (Rwanda), Building Tomorrow at IU (Uganda) and Play 360 (Tanzania, Kenya), met with students and other members of the IU community and presented about their missions and work. GBA Executive Director Dena Hawes spoke of GBA’s experiences in DR Congo and recent initiatives there. Dena and the Giving Back to Africa Student Association (GBASA) were also on hand to answer questions, network, and sell a variety of African fabrics, curios, and handmade cards. GBA is thrilled to be a part of its communities in both Bloomington and DR Congo and thanks Books and Beyond for hosting the event. For information on how you can get more involved with GBA, check out this page. After over nine months of planning and careful crafting, the 2014 annual gala, Congo: Continue the Story in Song, took flight on Thursday, September 4th, in Bloomington. With the help of diligent and dedicated volunteers, staff, donors, and friends, working on projects ranging from auction procurement to invitation design, we were able to pull off our best gala yet. At the gala, we enjoyed betting on silent auction items, mingling with new and old friends, listening to talks by GBA leaders, and taking in the authentic African music of Sweet Posion. Our African Marketplace was even more diverse than last year, and our appetizers and dinner were exceptional. We were all wowed by the premiere of a documentary from Katy Nielsen, who shot footage and conducted interviews in DR Congo while with GBA leaders on a trip there in March. You can view the documentary by clicking here. Overall, the variety of activities, the warm environment, and the beautiful stories that came together at the event made for a night to remember. We want to extend our immense gratitude to all who helped with and attended the event. We raised more funds this year than last, and we are excited to see these proceeds be transformed into programming for our students. We hope that you will keep journeying with us as we move into the end of 2014 and beyond. To stay connected with us, you can find us on Facebook, follow us on Twitter @GBAfrica, or sign up for our free newsletter. Also be sure to check back on the website for new blog posts and updates. Please also consider sharing our donation link with your friends and family or volunteering you time or resources to help out. We look forward to working with you! Keep reading to see some photos from the night. You can view a whole album of photos on our Facebook page. The Indianapolis Dare Me for Charity event is now only about a month away! On Friday, July 25th, our GBA team, led by intern Patrick Gower, will make leaps of great heights in order to win community support and funds for GBA. Dare Me For Charity is a reality television/extreme adventure charity event where participants jump from various heights of platforms in order to earn distance points for their team. Each team member gets three jumps from the main jump tower, and the team with the highest total amount of distance jumped at the end of the event will win $1,000. The jumps will be made from a platform that Patrick describes as a cherry picker. The platform is adjustable, with a maximum height of 40 feet—the highest that any individual is allowed to jump. However, participants can jump from any height they want that is below 40 feet, and they do not have to jump at any designated height. What's great about this opportunity is that you don’t have to be an extreme sports lover to participate in the event! The airbag below the platform is 11 feet high, so even if you make all of your jumps from 15 feet, you’re still earning 15 feet for the team’s total distance while only really falling 4 feet. Any jump will help GBA’s chances of earning the grand prize. Anyone is welcome to join the team or to come and support us the day of the event! The event will be held at Washington Square, in Indianapolis, on July 25th at 9:30 a.m. All teams must arrive for training at 8 a.m. The team will be carpooling from Bloomington to Indianapolis (a one hour trip). Anyone wishing to join the carpool can contact Patrick or GBA’s Executive Director, Dena Hawes (director@givingbacktoafrica.org). As of June 20th, we have six jumpers (that's 18 jumps! ), but we are hoping to add even more to the team! It’s not too late to register. Please go to the Dare Me For Charity website link below and click on Indianapolis. 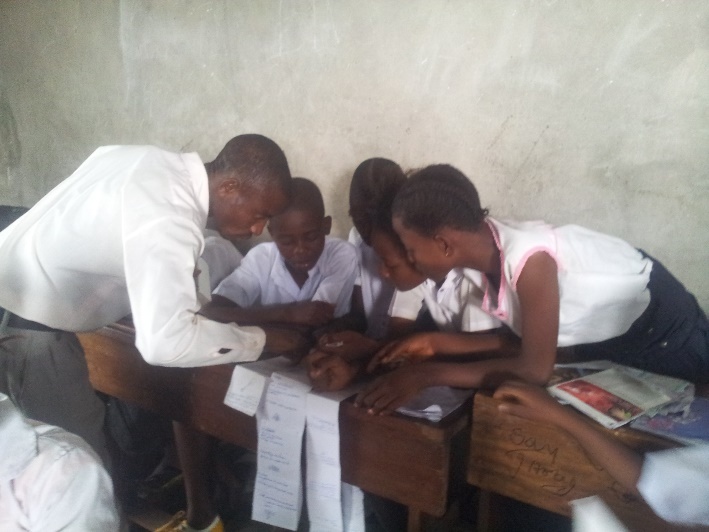 Search for our team, titled “Empowering Youth Leaders to Change their Reality in DRC,” and click on our page. On the page, you will see a link to register to jump with us. We will see you on July 25th!